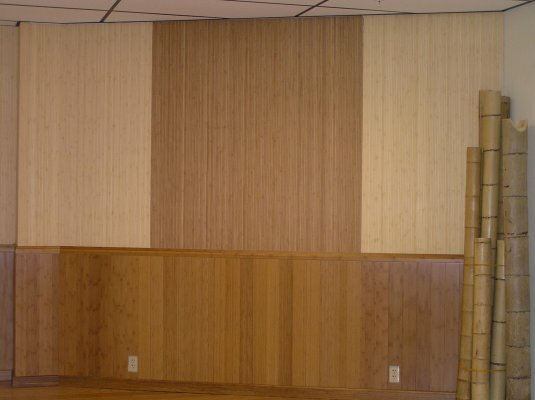 Bamboo wallpaper, which functions as wall covering, is a pleasant building material for walls, ceiling, columns, beams, and panels to create a beautiful and serene natural atmosphere at your home. In your kitchen, right above the countertop, bamboo wallpaper will decorate such area for you to be in a natural and serene environment while working on cooking. Bamboo wallpaper comes in a 72" long roll at various selections in height, which is made of 7/16" wide bamboo strips that are glued side by side in height direction onto a high-quality dense cottom backing. Two solid colors are available: Natural and Caramel. Easy installation with utility knife and snippers and panel adhesive at your own choice. Then finish or stain the surface at your wish.